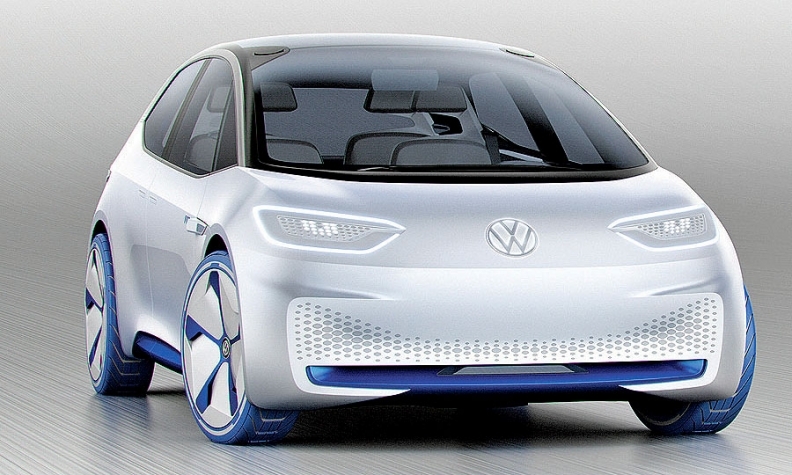 VW's new EVs will have no grille, like the I.D. concept, pictured. DETROIT -- Volkswagen is developing a fresh design language for a new generation of purpose-built electric vehicles. Klaus Bischoff, VW brand's head of design, said battery packs make it possible to change the fundamental shape of the vehicle. That will lead to vehicles that are taller and have short overhangs, shorter hoods, longer wheelbases, more-raked windshields and bigger passenger compartments. "To cope with that we need to correct proportions," Bischoff said in Detroit this month. "Essential for this is huge wheels, huge in diameter -- but also wide." "To gain the travel distance -- range is essential -- we need to have outstanding drag coefficients, and this will also influence the shape of the cars quite a bit," Bischoff said. With virtually no front to the car, overhangs can be extremely short, maximizing the wheelbase and expanding the passenger compartment. VW designers also pushed the dashboard forward by 127mm (5 inches) to give even more legroom. "The I.D. has the interior space of a Passat [midsize] with a footprint smaller than the Golf," Bischoff said. "We don't want a grille," he explained. "Volkswagen, if you look back [at the Beetle], was born without a grille. The engine was in the back." In the interior, VW designers are shooting for the "ultimate reduction" -- eliminating console elements in favor of a tablet and a heads-up display enhanced by augmented-reality.